US President James Madison Declared War on Canada two hundred years agao today and launched the War of 1812 Which Shaped Canada Forever. 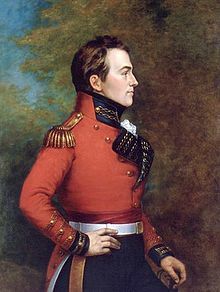 Brigadier-General Isaac Brock heard the news while he was dining with American officers at Fort George. They finished the dinner in peace then withdrew to plan mutual destruction. “My situation is most critical…Most of the people have lost all confidence. I, however, speak loud and look big,” Brock wrote. Today, we cannot lose confidence. Just as Sir Isaac did 200 years ago, we must “speak loud and look big.” Together, we can win this war, too. The ‘right to silence’ is protected in Sec 7 and 11(c) of the Canadian Charter of Rights and Freedoms. oops (above). As with all wars, it’s interesting to ponder how different our lives would be had things turned out differently. I’m of French Canadian descent, strong in Canada today, very likely marginalized under a different fate. Thank you Sir Isaac Brock and those who fought along side you. The United States did not declare war on Canada but on the United Kingdom. This is a big pet peeve for me. Upper and Lower Canada were merely British colonies. What does that say about the American War on Terror? Nice way to create lots of self identified victims. Thx for the welcome Just Me. Been lurking for a month or two now. To what extent is the Harper government using the 1812 bicentennial to promote the militarism that sent Canada into Afghanistan? I am surprised that no Canadians noticed that the War of 1812 got attention in USA today, or at least the version that is available in Bellingham MacDonald’s right next to the Canadian border. @Blaze. Just read on Mopsick’s blog that you’re no longer interested in participating in what I assume is Brock. I’m sorry to hear this, I truly valued your ‘take no prisoners’ attitude. Perhaps you’ll reconsider. The attitude of one, or even more than one, does not diminish the quality of your input! Yes Mr. President, Canada did trump the US in the War of 1812. Mr. President, please build your wall NOW.